The first Catholic Mass was celebrated in Botetourt County on August 5, 1981 at the home of parishioners Richard and Rosalie Sloan. Father Scott Duarte, associate pastor of St. Andrew’s, leads the service; Masses continued until October. In 1988 monthly meetings began to spur interest in a Catholic Church Community in Botetourt County. St. Mark’s United Methodist Church in Daleville opened its doors to the Catholic community for worship, fellowship and religious education. Later that same year Bishop Walter Sullivan celebrates Mass and declares the site a Mass Station of St. Andrew’s. Father William O’Brien serves as pastor. A few months later Bishop Sullivan elevates the Mass Station to a Mission Church. 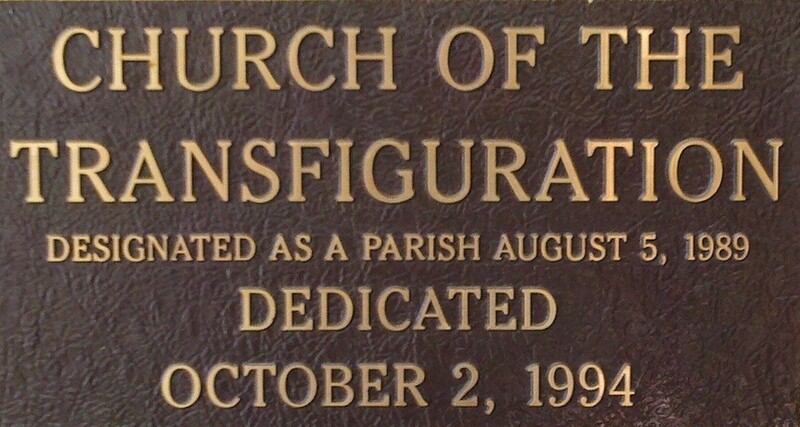 On August 5, 1989 a new Catholic parish in Botetourt County is established…Church of the Transfiguration. Sister M. Madeline Abdelnour becomes its first pastoral coordinator. Mass is moved from St. Mark’s to Fincastle United Methodist Church. Sister Madeline retired in 1991 and passed away shortly thereafter. Sister Eveline Murray becomes the second pastoral coordinator and plans for a permanent home are underway. Fathers Carl Naro, Joseph Metzger, Don LeMay and Joseph Facura celebrate weekly Mass. Land is purchased and the Church of the Transfiguration is dedicated on October 2, 1992. Fathers Lawrence Mullaney and Timothy Huffman serve as priests for the parish. Several years later, expansion takes place! A 14 room education wing is built. Deacon George Heise is ordained as a permanent deacon. Fathers Joseph Lehman, Andre Antao and Robert Warren celebrate Masses. The parish is served by both priests and a deacon associate for the first time. In 2003 Sister Eveline leaves to become a missionary in Africa and Deacon George takes over as Administrator. In May of 2004, Father Ken Shuping becomes our first resident pastor. In 2007 Father Shuping is transferred to St. Jude in Radford. Father Rene Castillo serves as pastor (clustered with St. John the Evangelist in New Castle and St. Gerard’s in Roanoke) in 2008; followed by Father Arlon Vergara who is assigned later that same year as parochial vicar at Transfiguration and St. John’s. Father Arlon then becomes parish administrator for both churches. In July 2009 our second resident pastor, Father Stephen McNally arrives. Father Steve continues to serve as the resident pastor for Church of the Transfiguration as well as being clustered with St. John the Evangelist in New Castle, St. Joseph in Clifton Forge and Sacred Heart in Covington. Fr Steve celebrated his 25th anniversary as a priest in May 2011.